On behalf of the FoRRP directors, thank you for your ongoing involvement in our parks in 2015! 2016 calendars are still available! A modest contribution of $10 supports FoRRP initiatives about the history of our parks and neighbourhood. You can order by emailing us at friends@roxtonroadparks.com or pick them up in person at Ziggy’s on College (just west of Shaw St) or Tampered Press on Dundas (just east of Shaw St). Here are a few of my favourite moments from the past year. Tim keeps the pancakes coming at park Breakfast in January. Mike, Tamara and Frank at the Block party in August. 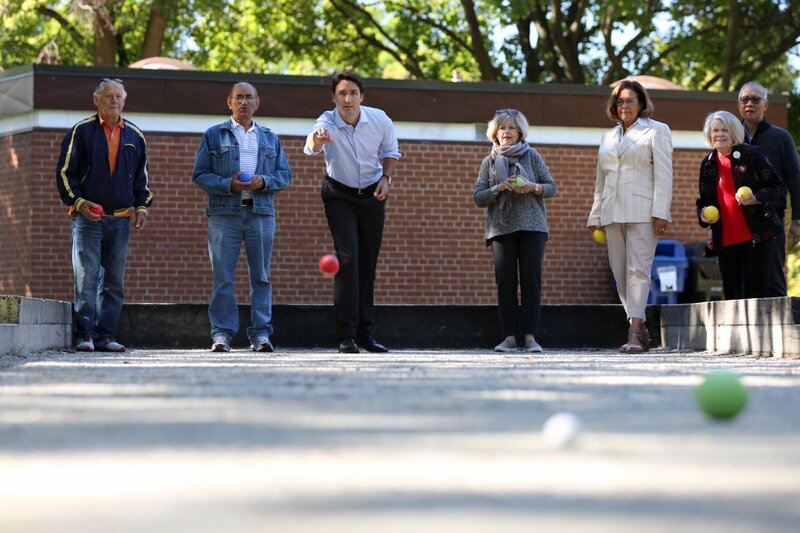 The future Prime Minister during a campaign stop in Fred Hamilton Park, September. The WaterHarvest project really got rolling in early October. Night of the Living Fred, on an October afternoon. Thank you again and again for your continued leadership. It’s so somderful to see all the improvements you are making to the city through Fred Hamilton. Community engagement shapes cities through each individual’s ideals, what you do at Fred Hamilton park is important!